Turbo-charging a new Dodge Challenger. WyoTech grads team up with HorsePower to help a deserving soldier's daily driver. HorsePower combines new engine technology and world class race car technology for a supercar Project. Track car gets ready for a lucky winner's home. Turning a stock GT into Roush car. HorsePower builds and old-world, new-world high performance smallblock�. Building a recycled big Hemi engine on a small budget. Classic old '55 Chevy gets twin-turbo big block monster. 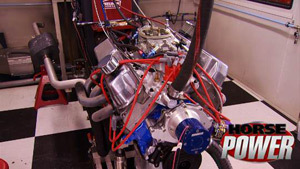 HorsePower upgrades a late model four-banger with amazing horsepower results. 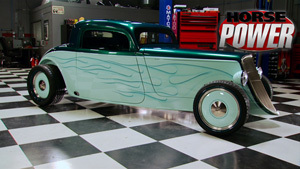 HorsePower joins forces with Ford and Factory Five to build the ultimate '33 street rod with modern day power! A workhorse 235 gets new life and new horsepower. Making more small block power with alcohol. 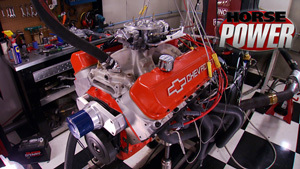 HorsePower's 572 big block on nitrous. The Ultimate Small Block Budget Build. 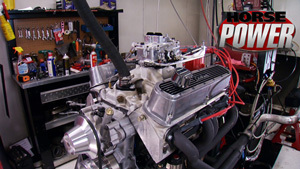 HorsePower goes into complete details of a smallblock Chevy stroker engine build. This how-to shows everything you need to know about engine blueprinting, preparation and the build of the budget-minded engine short block. HorsePower tears down and rebuilds a pair of Ford 351 smallblocks - a Cleveland and a Windsor. HorsePower builds a sleeper 1997 Ford Thunderbird. Building a classic Ford 460 on a rock bottom budget. HorsePower builds a 1992 Camaro for optimal fuel economy and horsepower! The mid-eighties Chevy Monte Carlo is a new old hot rod with unlimited potential. Joe and Mike get an '86 and start a buildup that includes a new, big block powerplant, manual five-speed transmission, and more. The idea is to build the car they think Chevy should have built back in the beginning. 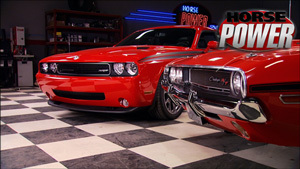 HorsePower hosts, Mike Galley and Joe Elmore embark on a mission: to build a car that can compete in heads-up Outlaw racing events! They start with buying a 1979 Chevrolet Malibu. Back at the shop, they tear everything out of the car that won't be used in racing...which is just about everything! HorsePower goes on a mission to build one raunchy rat rod! 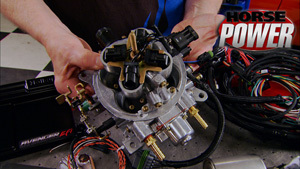 Mike and Joe kick off a two-show build up transforming a stock '06 Mustang into a Roush Stage 3. After base line runs, they wake up the GT big time with a bolt-on Roushcharger! Our mission: treat the car to some budget bolt ons that'll deliver the most horsepower possible for your hard earned money. Our big 474 inch Pontiac delivers a fat 550 hp on dyno!